In 1977, NASA launched Voyager 1 and 2 on a grand tour of the solar system and into the mysteries of interstellar space. Attached to each spacecraft is a golden phonograph record containing Earth's greatest music, spoken greetings, "Sounds of Earth," and more than 100 images encoded as audio signals, a technological feat at the time. Technical director Frank Drake had always planned to encode the photos in the audio spectrum for the record. The challenge was finding technology capable of the task. While flipping through an electronics catalog, Valentin Boriakoff, Drake’s colleague at the National Astronomy and Ionosphere Center, stumbled upon Colorado Video, a small television equipment firm in Boulder that had built a unique device for encoding television images as audio signals that could be transmitted over telephone lines. Donating their time and expertise to the project, engineers at Colorado Video projected each Voyager slide onto a television camera lens, generating a signal that their machine converted into several seconds of sound per photo. A diagram on the aluminum cover of the Golden Record explains how to play the phonograph record and decode the images. This audio file came from the original master tapes from 1977. While the audio was digitally transferred at 15 inches per second as per the reel's box, the correct speed for playback and decoding should be twice that. Also note that in order to conserve space on the original Golden Record, half of the images are encoded in the left channel and half in the right. 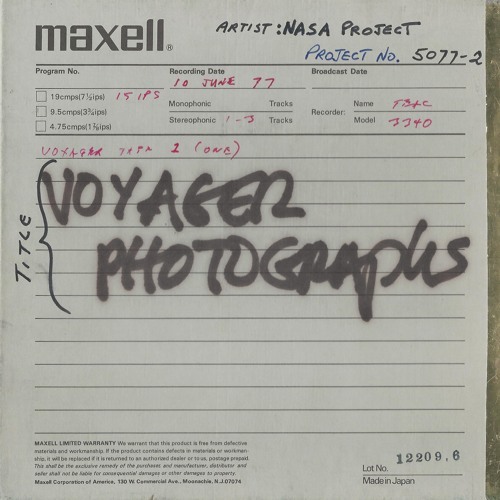 On September 5, 2017, the 40th anniversary of Voyager 1's launch, Boing Boing published Ron Barry's article about how he successfully decoded the Voyager Record's images from this audio file. Here is the video of his results and explanation of the process: https://boingboing.net/2017/09/05/how-to-decode-the-images-on-th.html The Voyager Golden Record is now available from OzmaRecords.com as a 3xLP vinyl box set or CD package. Both formats include a book featuring all of the original images printed in full color. I am listening to this every time before I go to sleep, It really opens up your mind and the dreams are so vivid, You must try this guys!